"We think he's about twelve-years-old but he has no road sense whatsoever. He just runs across the road to the bus stop." The absolute worst that could ever have happened has occurred and Casper is dead. The beloved twelve-year-old tuxedo from the Barne Barton section of St. Budeaux in Plymouth was struck and killed by a hit-and-run taxi driver early on January 14th. 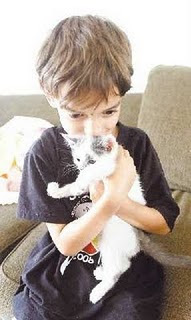 Although there is not any reason to doubt her sincerity, she apparently did not think enough of the moggy that she adopted from a shelter in 2002 to provide him with either a memorial service or a proper burial. Instead she took the cheap and easy route and had his remains cremated. It is not known if she even retained his ashes as a memento. 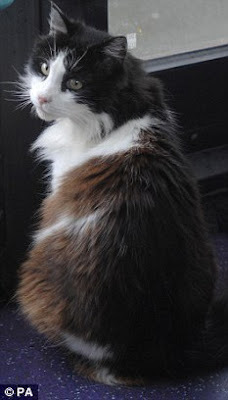 She did, however, post the following notice at the fatal bus stop: "Many local people knew Casper, who loved everyone. He also enjoyed the bus journeys. Sadly, a motorist hit him...and did not stop. Casper died from his injuries. He will be greatly missed...He was a much loved pet who had so much character. Thank you to all those who befriended him." Tributes from as far away as Argentina, Australia, and Indonesia attest to his popularity and he is scheduled to be featured in a children's television show later this year. New York publisher Simon and Schuster has lined up an unidentified Scottish author to pen a book about him that is expected to be released in the fall. "It's lovely to think he will go on in memories and with this book his story will live on forever," Finden told the Daily Mail on January 28th. (See "Casper the Commuting Cat to Be Immortalized in New Children's Book after Hit-and-Run Death.") "I can't wait to see it and, at the end of it all, the money (which she is donating to animal charities) will help other unfortunate creatures..."
The fact that Casper survived for as long as he did in the mean streets of Plymouth in attributable in no small part to the consideration and care that he was afforded by Stonehouse and other drivers of the number three bus who dropped him off at his house at the conclusion of each trip. "We were devastated to hear that Casper had been involved in an accident...," Marc Reddy of First Bus stated on the company's web site. (See "A Tribute to Casper the Cat.") "On hearing the news of his death, many of the drivers expressed sympathy for him and Susan, and we contacted her to offer our collective condolences." "Casper touched many people's lives and clearly had a very exciting life traveling around Plymouth and who knows where else," Reddy continued. "I suspect he's now exploring heaven and is telling all the other cats up there about the many adventures he had." While many individuals will sans doute find Reddy's perfunctory silliness about the immortality of the soul to be comforting, the stubborn fact remains that this beautiful cat would still be alive and well today if Finden had exercised one iota of either care or intelligence. As any fool knows, commercial streets are far too dangerous for even pedestrians let alone cats. In most jurisdictions, derelict police forces do absolutely nothing to enforce the rules of the road. As a consequence, speeders, aggressive drivers, red light violators, drunks, and mobile phone gasbags rule the roost and woe be it to any person or animal who happens to cross their path. "If he'd been ill we might have prepared for it but it hasn't helped us that the driver didn't stop. We couldn't believe it!" Finden told The Herald in the article cited supra. That, however, is a far different tune from the one that she was singing six months earlier. "We think he's about twelve-years-old but he has no road sense whatsoever," she confessed to The Herald on July 29th. 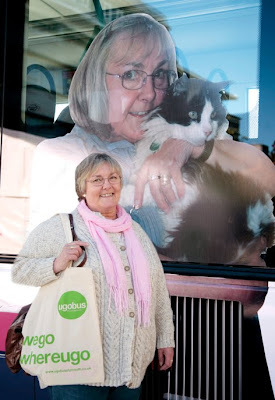 (See "Cat Rides Bus So Often It Gets Picture on Side.") "He just runs across the road to the bus stop." Clearly, she knew all along that she was playing Russian roulette with his life by allowing him to venture out into traffic. Instead she placed her trust in the drivers to keep him out of harm's way. "I'm really appreciative to all the drivers for making sure he gets home safely," she told The Herald in the July 29th article. "I'd hate to lose him." While Casper no doubt was safe enough when he was aboard the coaches, all of that changed the moment he disembarked and was totally nonexistent when he was crossing Park Poole Road in order to reach the bus stop. At such times he was at the mercy of Plymouth's Demolition Derby motorists. A far safer alternative would have been for Finden to either have put him in a carrier or on a leash and accompanied him on these trips. At the very least, she should have carried him across the street and put him on the bus. Likewise, she should have been waiting at the stop to collect him one hour later when he returned. After all, it apparently was from watching her that he learned to take the bus in the first place. "I used to catch the odd bus, too, so maybe he saw me and got curious what I was doing," she acknowledged in an interview conducted last summer. On February 15, 2009, Eco, head mouser and mascot at the police department in Hamilton, Massachusetts, was struck and killed by a motorist. Even more disgraceful, this was the second time that he had been hit by one. Although there are not any intermediate stops along his 1.2 kilometer commute and the train that he rides is a miniature model that has been in service since the early 1930s, it is believed that he nevertheless still has to cross Burniston Road in order to get to the misnomered Peasholm Railway Station which actually is located in Northstead Manor Gardens. His fragile life is therefore every bit as much at risk as Casper's was in Plymouth. 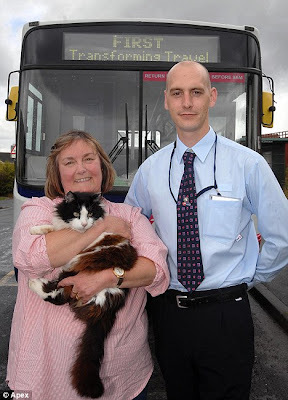 Cats are certainly entitled to their freedom but that does not include turning them loose on mixed residential and commercial boulevards, such as Poole Park Road, that teem with buses, taxis, lorries, and passenger cars. Exclusively residential areas that do not permit through traffic and culs-de-sac are however, in most instances, safe for cats. It is heartbreaking that Casper is dead and this sense of loss is compounded by the realization that he need not have died if proper safety measures had been put in place. Although it was the criminal conduct of the taxi driver that ultimately was responsible for his death, Finden actually signed his death warrant years ago through her gross negligence. First Bus cannot be let off the hook either. Because its drivers allowed him to ride and management even went so far as to capitalize on his notoriety, the company acted every bit as irresponsibly as Finden. The first time that any of the fleet's drivers spotted Casper in the street they should have telephoned the RSPCA or some other bona fide animal rights group. Finden should have been warned to either keep Casper out of traffic or face the prospect of losing him to a more responsible guardian. Even without the filing of an official complaint, the RSPCA should have acted independently since it obviously knew what was occurring simply by reading press reports. It accordingly owes the public an explanation for its dereliction of duty. Finally, the English media also are complicit in his death for failing to sound an alarm that Casper's life was in jeopardy. While his exploits made for cute copy and some great photography, there definitely was not anything either cute or pretty about the way in which he died. Because of the exalted positions that they occupy in society's pecking order, the members of the working press all too often consider themselves to be exempt from all moral obligations and this is terribly wrong. At the very least, the English media should have had the decency to have cared about Casper's safety. The unsettling picture that emerges from all of this is that Finden, First Bus, the RSPCA, and English media cared little or nothing about Casper's welfare. Instead they merely took advantage of his ignorance of the machinations of motorists for their own selfish ends. Now, like a pack of money-crazy ambulance chasers, the suits at Simon and Schuster are licking their chops in eager anticipation of all the shekels that they are going to make off of Casper's death. That sleazy New York crowd would travel to the end of this galaxy for a lousy nickel! Casper deserved better than what he got from all of these bloodsuckers. Photos: Press Association (Casper), Apex and the Daily Mail (Casper, Finden, and Stonehouse), and First Bus (poster of Casper and Finden). "We didn't know what to do." Getting a piece of meat stuck in one's throat can be every bit as deadly for cats as it is for humans. That was the near fatal lesson that a nine-week-old male kitten named, appropriately enough, Pork Chop learned last summer after he nearly died when a piece of pork became lodged in his tiny throat. The calamity unfolded on the evening of July 11th when Pork Chop and his mother went on an impromptu scavenger hunt through the trash at the home of their owner, Tabitha Fallis, in Chippewa Township, Michigan. Once Pork Chop began choking on the meat, Fallis tried everything she knew in an effort to dislodge it. She gave the Heimlich maneuver a try, patted his back, and even poured water down his throat. Somehow Pork Chop made it through the night on his own but he still was gasping for breath the following morning. That was when Fallis rushed him to Dr. Martha Grant at the Mount Pleasant Animal Hospital. With the aid of forceps, Grant had little difficulty in removing the offending piece of meat but to her horror Pork Chop then inexplicably stopped breathing and collapsed. When Grant informed Fallis that Pork Chop had died she began to cry. Apparently moved by her client's tears, Grant decided to make one last-ditch effort to revive Pork Chop by administering mouth-to-mouth resuscitation while simultaneously rubbing his belly. Miraculously that did the trick and the tiny kitten was soon breathing on his own again. As traumatic as Pork Chop's brush with death was, it did serve to further endear him to Fallis who shortly thereafter elected to keep him. Unfortunately, new homes were found for his siblings. Pork Chops's plight also underscores the necessity of cat owners to provide safe home environments for their companions. After all, it is difficult to predict what cats, especially kittens, will attempt to eat. Additionally, around-the-clock access to a veterinarian is crucial, especially in emergencies of this sort. Fallis is extremely fortunate that Pork Chop made it through the night with the obstruction in his throat but she should not tempt the Fates by continuing to go without access to emergency veterinary assistance. Photo: Lisa Yanick-Jonaitis of The Morning Sun. "On first response, she appeared dead. She was cold, stiff, and unresponsive. When I picked her up, I did hear an agonal cry, but that sometimes happens postmortem." Winters in the frigid northeast exact a grievously high toll upon cats that are left exposed to the elements. For in addition to the constant threat of hypothermia, the scarcity of food makes surviving for any measurable length of time almost impossible. Massive snowstorms compound these already formidable problems by making it extremely difficult for these diminutive creatures to even get around. Since records of this sort are not kept, no one knows exactly how many cats fall victim each year to the cruel machinations of Old Man Winter but the carnage surely must be in the tens of thousands at a minimum. 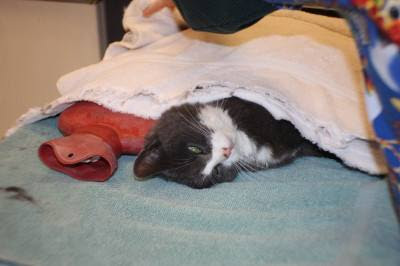 Earlier this month, a thirteen-year-old tuxedo named Annie from the Boston suburb of Norfolk would have perished in his icy grip if it had not been for the timely intervention of a Good Samaritan and an animal control officer. Annie was discovered emaciated and apparently frozen to death in a snowdrift on January 2nd near Main Street and Sweetland Farm by an unidentified Good Samaritan. The rescuer wrapped her in a blanket, placed her inside a garage, and then telephoned Norfolk Animal Control Officer Hilary Cohen. Upon arrival on the scene, Cohen initially thought that the only thing left for her to do was to play undertaker. "On first response, she appeared dead," she told The Sun Chronicle of Attleboro on January 5th. (See "Cold Kitty Case in Norfolk.") "She was cold, stiff, and unresponsive. When I picked her up, I did hear an agonal cry, but that sometimes happens postmortem." Even though the situation looked hopeless, Cohen nevertheless elected to try and save Annie's life. "I kept her in the blanket and put her on my lap in the cruiser and headed to the hospital," she told WBZ-TV of Boston on January 5th. (See "Cat Found Frozen, Thaws, Survives.") "Once in the car, I turned the heaters on and saw a whisker twitch. That was the only sign of reflex I saw from her." It was enough, however, and along with the heat it most likely saved Annie's life. It is unclear why the Good Samaritan did not take Annie inside and attempt to thaw her out as opposed to leaving her in the garage. After all, common sense would seem to dictate that what she need most was heat. She also was given intravenous fluids and steroids. Blood tests were administered, blood sugar levels monitored, and her heart rate, which was surprisingly good, constantly checked. Because she needed additional heat therapy, Cohen generously took Annie home with her rather than dumping her off at a shelter. Annie's incredible streak of good fortune continued on January 5th when her previous owners, having read about her misadventures in The Sun Chronicle, came forward to reclaim her. They reportedly had lived in Norfolk for only about a week before Annie disappeared and although she was found only three-quarters of a mile from home she nonetheless had crossed railroad tracks and several other obstacles in the course of her ill-fated journey. It thus would appear that the intrepid feline was attempting to return to her old abode. 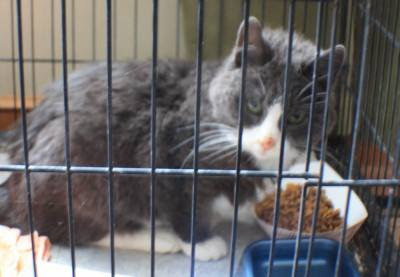 It therefore generally is a good idea to keep a cat either indoors or enclosed in a fenced-in yard for at least four to six weeks after relocating. Hopefully, after that it will have adjusted to its new environment and abandoned all thoughts of returning to its old home. Since Annie disappeared in early December she was on her own for about a month and that accounts for her emaciated condition. Although her owners reportedly contacted Animal Control and put up "Lost Cat" posters neither tactic was successful. Not too many owners of lost cats are given a second chance in order to make up for their past negligence but thanks to the compassion of Cohen and the Good Samaritan that is not the case with Annie's owners. Hopefully, this time around they will keep a closer eye on her and make sure than nothing bad ever happens to her again. Because of her advanced years, she deserves at least that much. Furthermore, it is axiomatic that cats cannot survive in cold weather without shelter anymore than humans. 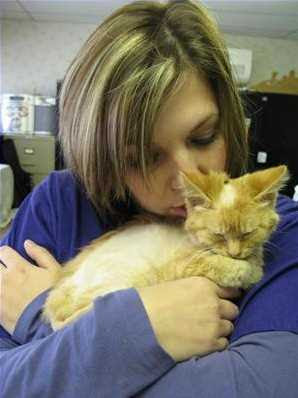 For example, on February 16, 2007 a two-year-old cat named Roo from Lower Windsor Township in Pennsylvania was discovered with his front paws frozen to the side of a road. In addition to motorists who make a sport out of running down cats, some individuals like to mutilate them and then stand back and watch as the elements finish the job for them. 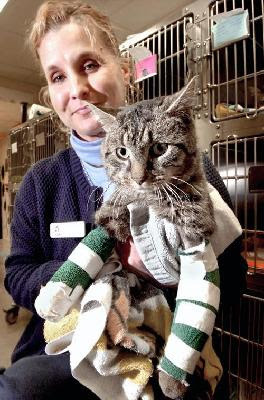 That was the predicament that a twelve-week-old kitten named Chopper from Chatham-Kent in southwest Ontario found himself in after an assailant divested him of his fur in November of 2008. In conclusion, anyone who is in a position to help a homeless cat make it through the winter is strongly urged to open up either his or her heart and do so. Crawl spaces underneath houses, outdoor sheds, barns, and makeshift shelters often mean the difference between survival and death by hypothermia. Meat and milk also are desperately needed. Photos: The Sun Chronicle (Annie), Bill Bowden of the York Daily Record (Roo and Smith), and Erica Bajer of The Chatham Daily News (Chopper and Spero). The reason behind this allegation is the one-thousand-yards of six to eight-foot razor-wire fencing that surrounds the ex-Beatle's thirty-eight-acre estate known as Friar Park in Henley-on-Thames, Oxfordshire. Although accurate statistics are in short supply, at least four cats from the neighborhood have been impaled on the deadly razor blades in recent years. 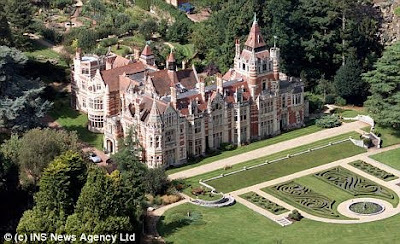 Appraised at in excess of $32 million, the one-hundred-twenty-room Victorian neo-Gothic mansion already had a rather checkered past even before this controversy erupted. For instance, it served as a nunnery for the Salesians of Don Bosco before it was purchased by Harrison 1970 just prior to the breakup of the Beatles. The Salesians, it might be recalled, aided and abetted the English ruling elites in a thoroughly shameful scheme that saw one-hundred-fifty-thousand poor and economically disadvantaged boys and girls rounded up and shipped to Canada, Australia, colonial America, and elsewhere between 1618 and 1967. Before being acquired by the nuns, Friar Park was owned by a lawyer and horticulturalist named Frank Crisp between 1875 to 1919. Harrison later paid tribute to him by writing and recording The Ballad of Sir Frankie Crisp which is also known as Let It Roll. 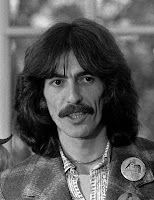 A CD by the latter title containing nineteen of Harrison's best known recordings was released to the public on June 16th of last year. The estate, which used to be open to the public, was closed after Lennon's murder in Manhattan in 1980 and Olivia had the razor wire installed in 1999. Because the wooden portion of the fence is now rotting and the razor wire aging, Harrison has petitioned local authorities to replace them with more of the same. Opposition to the fence is being led by seventy-two-year-old actor and comedian Rodney Bewes who is best known for his role as Bob Ferris in the BBC sitcom The Likely Lads, which aired between 1964-1966, and its revival as Whatever Happened to the Likely Lads between 1972-1974. "Is the razor wire really necessary?" he asked the Henley Town Council in a letter quoted by the Daily Telegraph on September 25th of last year. 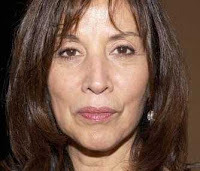 (See "George Harrison's Widow Wins Razor Wire Planning Battle.") "Our cat has been caught three times, once severing an artery (and nearly losing his tail on another occasion), and we know of three other cats who have been injured." As the rich widow of a former Beatle, Harrison's security concerns cannot be dismissed lightly. After all, back on December 30, 1999 thirty-three-year-old Michael Abram broke into Friar Park and stabbed her late husband seven times. While Harrison futilely chanted "Hare Krishna" at his relentless attacker, it was left up to the Mexican-born Arias to beat him off with a poker and table lamp. Already suffering from throat cancer, the attack sans doute hastened his death in Los Angeles twenty-three months later. Despite their obvious shortcomings, jurists in America so far have shown the bon sens to keep Lennon's murderer, Mark David Chapman, behind bars where he belongs. 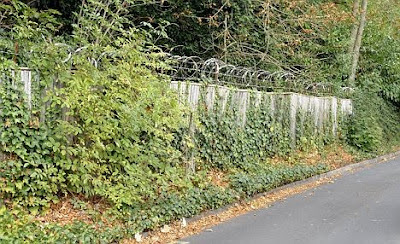 Nevertheless, it must be pointed out that the fence is not necessarily the best way of protecting Olivia and her family. "It doesn't make it any more secure," Bewes protested to the Daily Mail on September 5, 2009. 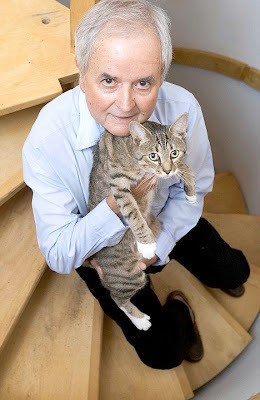 (See "Unlikely Spat: Rodney Bewes Goes to War with Beatles Widow over Razor-Wire Fence That 'Nearly Killed' His Cat.") "The bottom half is wood and with a good crowbar you could get through it no problem." A far better alternative for Harrison, since she obviously has money to burn, would be to hire security guards and perhaps purchase an Alsatian. The estate already has surveillance cameras in situ. Of course, it is conceivable that she would consider the presence of a security detail to be too intrusive. That is what Lennon thought and it ultimately cost him his life. The presence of the razor wire also constitutes an unwelcome eyesore in the upscale neighborhood. "Lots of people have nice houses around here and none of us wants to be burgled but we don't all go around and put razor wire up," Bewes's wife, Daphne, told the Daily Telegraph in the article cited supra. "The new wire is going to be latticed which will probably take Maurice's eye out. You can't tell a cat not to be stupid and climb over it." Other neighbors, such as John and Anna Rayner, object to the razor wire because of its association with despotic regimes. It is "just downright unneighborly to impose Stalag Luft 17 on the residents around Friar Park," they told the Daily Telegraph. Fortress Friar Park is additionally an inappropriate monument for a man who preached the gospel of love and peace for thirty-five years. Much more to the point, the pain and needless suffering that the razor wire inflicts upon cats and other animals is anathema to Harrison's Hare Krishna faith. Unfortunately, Harrison is no longer in any position to come to the cats' defense but the same cannot be said for Olivia. By dismantling the deadly razor wire she would not only spare the lives of numerous cats but also enhance her standing within the community. Such an act of compassion also would be a fitting tribute to George's life and work. Photos: David Hume Kennerly of the White House via Wikipedia and the Gerald R. Ford Library (Harrison), Getty Images (Olivia), INS News Agency (Friar Park), Daily Mail (razor-wire fencing and Bewes and Maurice). "It's just horrible, and whoever did this, they need to be charged." 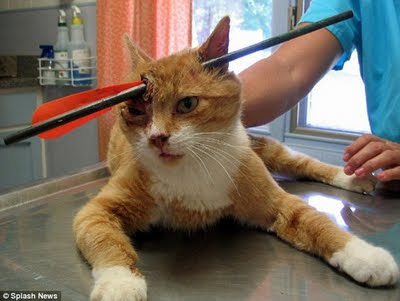 Despite the offer of a reward totaling at least $2,920, the person responsible for shooting a four-year-old orange and white cat named Brownie in the head with a thirteen-inch graphite arrow remains at large. Even more distressing, apparently neither the police nor humane officials have any leads in the case. 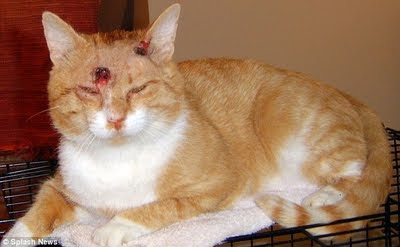 Luckily, it skimmed the skull and only the cat's skin, tissue, and muscles were damaged. Because they were not promptly treated, the wounds later became infected. No one knows exactly when Brownie was shot but in all likelihood it was several days prior to his discovery with the arrow embedded in his skull on August 24th by his owner, eighty-three-year-old Dillon Eaks. 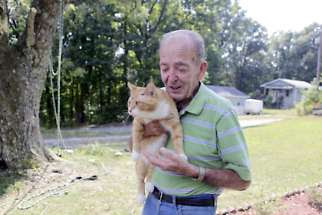 Even then it was not until a day later that Eaks was able to corral his wounded cat and get him to Towne and Country Vet Clinic. At the hospital, veterinarian Casey Shake sedated Brownie and removed the arrow, the tip of which already had been broken off by an unknown party. Shake then treated Brownie with antibiotics for the infections and left his wounds uncovered so that they could heal. In fact, Brownie was up and around the day after his surgery. By September 4th he was well enough in order to pay a brief visit to Eaks. (See photo below of the happy reunion.) A day later he appeared on NBC's Today Show. "It amazes me every day, the pain tolerance that animals have. They're a lot tougher than people," Shake told The Herald-Times on September 3rd. (See "Cat Hit by Arrow to Appear on Today Show.") "And the unconditional love that an animal can show. I think I'd probably be mad at the world if I was that cat. But he was purring when he left. I guess he made the best of his situation." Brownie's rather substantial veterinary bill was paid for by the Monroe County Humane Association (MCHA) through its Olivia Animal Protection and Rescue Fund. 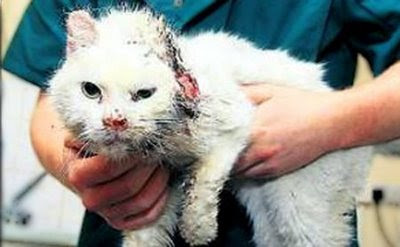 The fund is named in honor of a cat that was torched to death by a group of teens in 1997. As Monroe County Animal Control Officer Rebecca Brown astutely pointed out, the trajectory of the arrow cancels out any possibility that the wounding could have been accidental. "Anybody hunting wouldn't have been that low to the ground," she told The Herald-Times in the September 1st article cited supra. This detestable act of animal cruelty has both sickened and enraged Sarah Hayes of MCHA. "It's just horrible, and whoever did this, they need to be charged," she told The Herald-Times on September 1st. Unfortunately, there is not anything in the public record to suggest that either the police, MCHA, or Animal Control are actively working this case. Rewards and public denunciations are fine as far as they go but neither of them are going to contribute very much toward apprehending the person responsible for nearly killing Brownie. That is going to require good old-fashioned police work. Forensic evidence must be collected, residents of the area interviewed, and retailers that sell bows and arrows need to be contacted. Even if the perpetrator should be arrested it is unlikely that either he or she would ever go to jail because animal cruelty is ludicrously treated as only a Class B misdemeanor in Bloomington. Any attack upon an animal should be automatically classified as a felony that requires substantial jail time if convicted. She is wrong, of course, dead wrong. These types of abuses occur thousands of times every day all across America and rarely if ever are the assailants even arrested. The reason for this glaring neglect is rather simple: police and humane officials seldom bother to even look for them. Through their generous donations, private individuals are attempting to be helpful but they do not have either the authority or the resources to ensure that the animal cruelty laws are respected and enforced. Both they and, above all, the animals deserve better and it is up to the police and humane officials to stop running off at the mouth and start putting these monsters in jail. If they persist in ignoring these types of crimes, an effort should be made to entice bounty hunters, pet detectives, and others into entering the fray. The establishment of private militias dedicated to protecting cats and other animals is another option. One way or another these crimes must be stopped. Photos: Rebecca Brown of Animal Control via Splash News and the Daily Mail (Brownie), Jeremy Hogan of The Herald-Times (Brownie and Eaks), and MCHA (Hayes). "For the protection of people and other animals that frequent the island, the feral cats were caught and euthanized humanely...As things now stand, the domestic cat population has been neutered and hopefully there won't be too many kittens next year." Although the killers were quite obviously as pleased as punch with their bloodletting, they were nonetheless cautious so as not to disclose the exact number of cats that they had murdered in cold blood. Even though the island, which is located nine miles off the coast of County Donegal in northwest Ireland, only has a population of around one-hundred-seventy, it is likely that dozens of cats fell victim to the machinations of these latter-day, low-life Nazi degenerates. 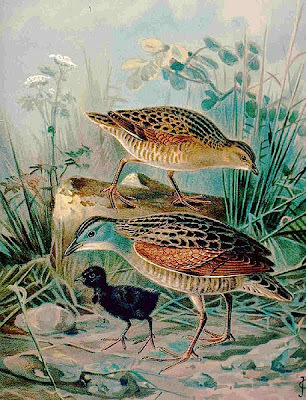 Contrary to reports in the Irish media, the Corn Crake is not an endangered species; rather, it is listed as "Near Threatened" by the International Union for the Conservation of Nature and Natural Resources and that is only one level removed from being of "Least Concern." Moreover, it is precisely the spread of modern agriculture in order to feed an ever growing population of meat consumers that is responsible for the birds' decline, not cats. After all, it is estimated that three to four pounds of corn and other grains are required in order to produce one pound of meat. Of course, bird advocates and wildlife biologists are such twenty-four karat phonies that they care absolutely nothing about either the species that they are supposedly protecting or Mother Earth. Their only raison d'etre is to defame and kill cats and for Birdwatch Ireland the defenseless and shamelessly abandoned felines on isolated Tory Island were easy pickings. Moreover, they assumed that nobody would either notice or care about the slaughter. As far as they were concerned the extermination was, in effect, the perfect crime. As is usually the case with bird advocates, the minds of the exterminators at Birdwatch Ireland are so corroded with hatred and prejudice that they are totally incapable of stringing together two logically consistent statements in a row. For example, after blaming the cats for preying upon Corn Crakes the organization's Sandy Alcorn goes on to accuse them of being a threat to humans and other unspecified species. Thirdly, since Corn Crakes are found in abundance not only on Inishbofin Island off the coast of County Galway, the Outer Hebrides in Scotland, and throughout Europe and western Asia as well, it is doubtful that many tourists travel to Tory in order to see them. It therefore seems likely that in addition to a rabid hatred of cats this extermination was undertaken for more mundane economic reasons. Alcorn and the residents of the island live off of the euros that tourists spend there and for reasons of appearance they do not want outsiders to see how shamelessly they abandon and mistreat cats. Moreover, they know as well as everybody else that it would not take very long for any halfway observant visitor to see through their phony-baloney facade and realize that Tory is not the idyllic community of artists that it is advertised to be. For example, back in November an Irish court awarded filmmaker Neville Presho sixty-thousand euros after the Ostan Thoraigh Comhlacht Teoranta hotel demolished his six-bedroom home and turned it into a car park while he was away working in New Zealand. Worst of all, when the police were called in to investigate the theft and land grab they ran headlong into a wall of silence as the island's residents steadfastly refused to cooperate. Not content with merely rounding up and killing Tory's homeless cats, Birdwatch Ireland also has sterilized all domestic cats on the island. "We took photographs of all the pet cats and provided them with collars before we started to catch the feral cats in humane traps and euthanize them," Alcorn explained to the Belfast Telegraph in the article cited supra. "As things now stand, the domestic cat population has been neutered and hopefully there won't be too many kittens next year." Clearly, Birdwatch Ireland is intent upon eradicating all cats from Tory Island. Next up on its perverse agenda is undoubtedly the interdiction of the importation of cats to the island. It also is important to bear in mind that in electing to systematically exterminate Tory's homeless cat population, Birdwatch Ireland categorically refused to even consider the numerous humane alternatives available to it. For example, the nests of the Corn Crakes could have been identified and fenced off. Since they most certainly do not have anything better to do with their time than to defame and kill defenseless cats, the membership of Birdwatch Ireland could have taken turns guarding the birds' nests twenty-four hours a day. A little bit of honest toil just might have sweated out some of the evil that adheres in their clogged pores. Aromatic defenses, such as those used to keep cats out of flower beds, also could have been employed. Ultrasonic guns, such as the English-made CatWatch, would have been another option. The money and time spent defaming and killing the cats also could have been more humanely and productively spent securing homes for them. Finally, as a last resort, a sanctuary could have been established for them on the five-kilometer-long island. That would have allowed them to live out their lives in their homeland. Nothing short of the shedding of additional feline blood will ever suffice for bird advocates, however. That none of these humane alternatives were even considered is not surprising in light of the Irish's overall disgraceful treatment of the species. Par exemple, on October 29, 2008, unidentified assailants outside The Old Ship bar at 44 Main Street in Arklow rammed a firecracker down the left ear of a cat named Sparkles and lit the fuse. In Dublin, homeless cats living on the grounds of St. James Hospital, the Custom House, shopping centers, and industrial parks are systematically rounded up and slaughtered. Even on some dairy and cattle farms they are treated in the same cavalier fashion. Since killing cats is now the rage all over the Emerald Isle, clearly the old Irish proverb that cautions individuals to be wary of those who dislike cats is no long en vogue. Birdwatch Ireland steadfastly refuses to acknowledge it, but the cats it has so ruthlessly murdered on Tory were brought to the island against their will, exploited as mousers and companions, and then cruelly abandoned in order to fend for themselves on a forbidding landscape. Their descendants were born there and therefore had an unequivocal right to live there in perpetuity. In fact, their rights far exceeded those of the seasonal Corn Crakes. Instead of being killed, they should have been provided with meat, milk, shelter, and veterinary care. If their numbers had become too unmanageable, a trap, neuter, and release program should have been inaugurated. Based upon the jaundiced reasoning of Birdwatch Ireland, advocates for frogs and insects would be totally justified in eradicating Corn Crakes from Tory in order to protect those species. Somehow and some way, Birdwatch Ireland and all those responsible for these en masse eradications must not only be stopped but held accountable in a court of law. Nothing short of an international tribunal established along the lines of the one in Nuernberg which tried the Nazis at the close of World War II will suffice. Until such a day arrives, it is imperative that all individuals who care about cats not only boycott Tory but all of Ireland and its exports as well. Cat-killers must not be subsidized under any circumstances. It would be better still if the United Nations would take up this matter and impose economic and political sanctions against Ireland and all countries that continue to abuse and kill cats. Unless swift and decisive action is taken, these exterminations are destined to continue. 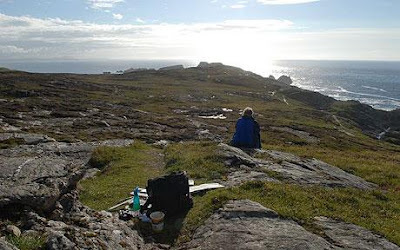 Photos: Daily Telegraph (Tory Island), Johann Andreas Naumann, Naturgeschichte der Voegel Mitteleuropas via Wikipedia (Corn Crakes), and Belfast Telegraph (Sparkles).